A series of FREE walking events, open to all ages. Pick up a Passport at your first event. Attend 5 and get a gift! A series of FREE walking events, open to all ages. Pick up a Passport at your first event. Attend 5 and get a gift! Join us later in the day for National Kids to Parks Day or even participate in our Free Fishing Clinic (pre-registration required). Learn about invasive plants in the area during this guided walk and educational talk. This fun walking series is perfect for all ages and is a great way to meet new people and get outdoors. Pick up your walking passport at your first visit. Learn about aquatic habitats during this guided, educational walk. This is a great way to get outside, exercise and meet new people. Enjoy learning about how to beat the heat, not your turf on this guided walk through Fabbrini Park. This is a great way to get out, move, and meet new people. 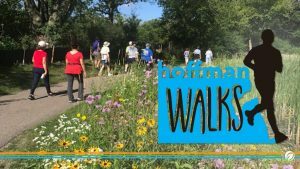 Hoffman Walks are offered each month and is perfect for every age. Join us for the biggest party of the summer at Party in the Park. Children's Entertainment, pony rides, petting zoo, children's games and more! This year all children's activities are free. Food is available for purchase.